High capacity machine with glass vessels made in England. Cast-iron and wood base in a zoomorphic shape, glass vessels. The simplest shape used with the vacuum process, consisting in two connected glass spheres, one above the other, with a cork plug and filter. The pressure of the steam made the water contained in the lower sphere rise and it mixed with the ground coffee contained in the upper one. When the spirit burner was removed, the air in the lower sphere cooled, creating a vacuum which immediately sucked the coffee infusion out of the upper vessel through a filter which blocked the grounds. Once the upper vessel was removed, the coffee maker was lifted using the special support in order to pour the coffee out. Invented in France around 1840, many variations of the shapes and materials of this coffee maker were produced and used throughout Europe and America. Coffee makers produced by the English Cona Company. Cona introduced a threaded rod which kept the filter steady against the tube of the upper vessel. 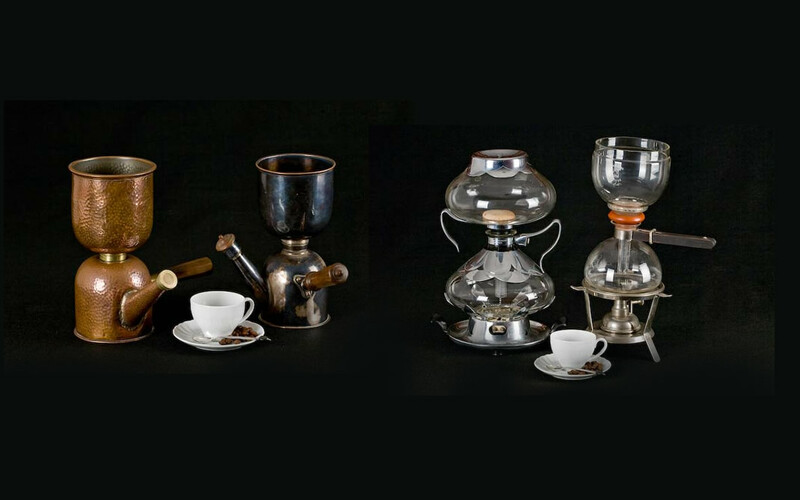 From 1910 onwards, it offered an extensive range of these coffee makers which became widespread in France and England. During the same years, the Silex Company introduced this coffee maker in the United States where it enjoyed enormous commercial success. 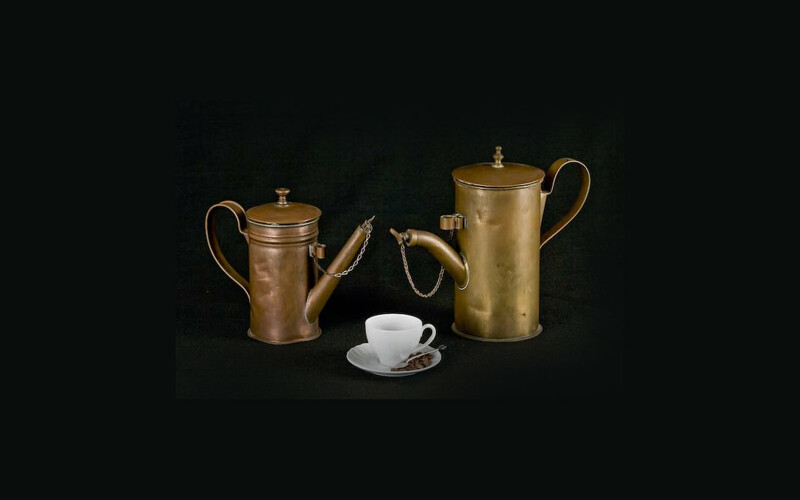 Produced in hand-hammered or silver-clad copper by Picard Ltd. in London, these depression coffee makers were certainly more reliable and easier to handle than the contemporary glass balls which were yet to be made in Pyrex. The two containers are joined by means of a screw thread with a filter in a fine metal grid. On the right: the German Sintrax in Jena dated 1930, with Pyrex glass spheres and spirit burner. On the left: the American Silex dated 1950 with an elegant electric burner and chrome-plated brass cladding. Two Hungarian-made models of different capacities made by Agrolux. A whistle at the top signalled when to switch off the electric supply. Once the infusion was ready, the whole coffee pot was lifted in order to pour the coffee out through the special spout. Elegant, silver plated Napierian coffee maker produced in England by Elkington & Co. with ivory finishes. It is a valuable evolution of the glass and porcelain model developed by Scottish engineer Robert Napier in 1840. Its function is based on the principle of creating a vacuum, just like the models with glass vessels set one above the other, with the difference that in this case they are set out on a horizontal plane instead. Machines also called Compensation Siphons or Balance or Gabet. These machines first appeared during the first half of 1800 in France, when a Parisian, Louis Gabet, obtained the patent in 1844 for a balance siphon model with a balancing counterweight. Operation is based on the principle of creating a vacuum, in the same way that the stacked glass spheres work: the only difference is that the elements are positioned on the same level and supported by a balance structure which makes the entire coffee brewing process automatic. The spirit burner has a movable cover that extinguishes the flame automatically when the boiler is raised (helped by a counterweight or spring), i.e. when the water, pushed by the heat, goes into the other glass vessel through a tube with a filter at one end. Here, the hot water mixes with the ground coffee. Under the vacuum created in the boiler, the coffee is sucked inside, leaving the grounds in the glass vessel. The coffee is served through the small tap. The invention of this apparatus is contended between Paris (Louis Gabet, 1844), London (Preterre, 1849) and Vienna (A. Reiss, 1855). Jean Baptiste Toselli, a Frenchman of Italian origin, incorporated and combined the various elements required in a compensation Siphons system into a perfect 40cm long train in his Cafetière-locomotive. The gilded brass chassis which formed the base was assembled on wheels, and the lower part held the spirit burner. The upper section supported the cylindrical ceramic body of the machine together with a finely worked basket for holding matches, coffee spoons or sugar. 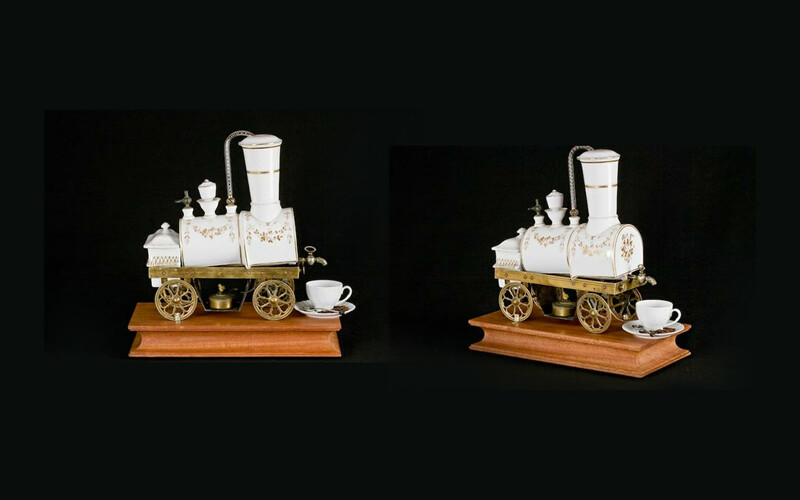 The ceramic body of the locomotive was internally split into two parts: the rear section (the boiler) contained the water, the front section the ground coffee. The body rested on a simple mechanism which made it tip back slightly when full of water and hold the underlying burner lid open. The heated water was pushed from the rear boiler into the other container set in the front of the locomotive through a glass tube. This was the part which contained the ground coffee, and the infusion process then began. The large funnel, slightly conical in shape, made it possible to put in the ground coffee and was necessary for the passage of the glass tube (the siphon) which had a large metal filter on the end. The body of the boiler, empty of the weight of the water, lowered leaving the lid of the burner free to close on the flame, automatically putting it out. Due to the effect of the vacuum created as the air cooled inside the heater, the coffee was immediately sucked up by the front container through the same glass tube leaving behind the grounds. The coffee remained in the heater, from which it was poured into the cups by means of a small pipe which ran underneath the apparatus through to an elegant tap set on the front of the locomotive. 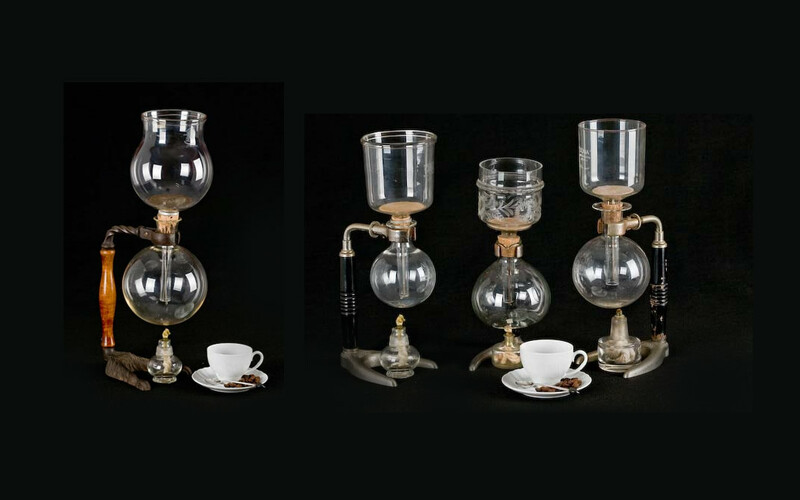 Each stage of the preparation process of the beverage could be followed by the diners: the boiler overturning, the puff of steam from the safety valve, the flame going out automatically, the passage of the hot water then the coffee at the end of the cycle through the decorated glass siphon. 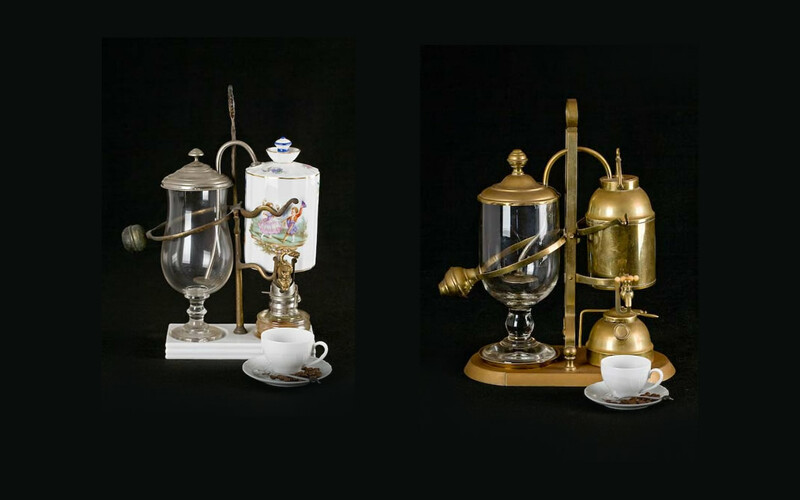 Two examples of what was called La Milanese in Italy, a coffee maker produced in internally tinplated brass or copper. This is, in fact, the coffee maker patented by Grandin and Crepaux in France in 1832. This machine can operate both with the Vacuum or Depression or Percolation or Filter system. Indeed, if the heat source was removed once the infusion process had been completed, then the device worked as a depression coffee maker. If, on the other hand, the lid on the spout was removed, it worked as a percolation coffee maker with atmospheric pressure only.